Lightening speed, good running techniques and a positive mindset distinguished the medal winners from the rest of the athletes during the Grenada Union of Teachers St. George’s 2013 Inter-Primary Athletics Championship at the Grenada National Stadium on 5 March, 2013. The committed sponsorship and vital partnership that Geo. F. Huggins & Co. (G’da) Ltd. has forged with the G.U.T. St. George’s Branch through the Ribena brand, has over the years led to the progressive development of this event. “This championship is the breeding ground for harnessing the budding talents of these students and should not be taken for granted,” said a statement from Huggins. Speaking at the Opening Ceremony on behalf of Ribena and its local distributor, Huggins Pharmaceuticals Division, was Mr. George “Porgie” Cherebin. He stated that he was tremendously satisfied with the continuous improvement and enthusiasm of the young athletes, but urged the organisers to lift the bar higher and strive towards improving the organisation of the games. Brief remarks were also given by Mr. Conrad Francis, Coordinator of Sports, Ministry of Sport; and Mr. Kenny James, President General, Grenada Union of Teachers. Hon. Anthony Boatswain gave his inaugural remarks in the capacity of Minister for Education and officially declared the meet open. He encouraged the athletes to do their best and to be disciplined. 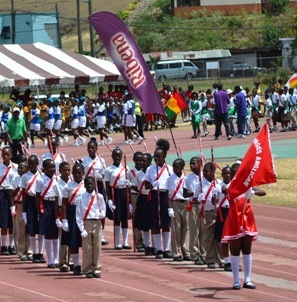 Ribena was also the title sponsor for the GUT Carriacou & Petite Martinique Inter-Primary Athletics Championship which was held on 28 February 2013. This is the fifth consecutive year that Ribena sponsored the event at Carriacou. Once the races began, the atmosphere was charged with a blend of excitement, anxiety and a hunger for victory. The South St George Government School (SSGGS) again proved why they are a force to be reckoned with on the track. They went home rejoicing after capturing the championship trophies in both the female and male divisions with 90 and 101 points respectively. The St George’s Anglican (SGA) jostled their rival Grenada Junior Academy (GJA) to the end. St George’s Anglican placed 2nd in the male division and 3rd in the female division, while GJA claimed 3rd in the male division and 2nd in the female division. SGA was elated to receive the trophy and of course bragging rights for the March Past by edging out the 2nd place finishers by just one point. 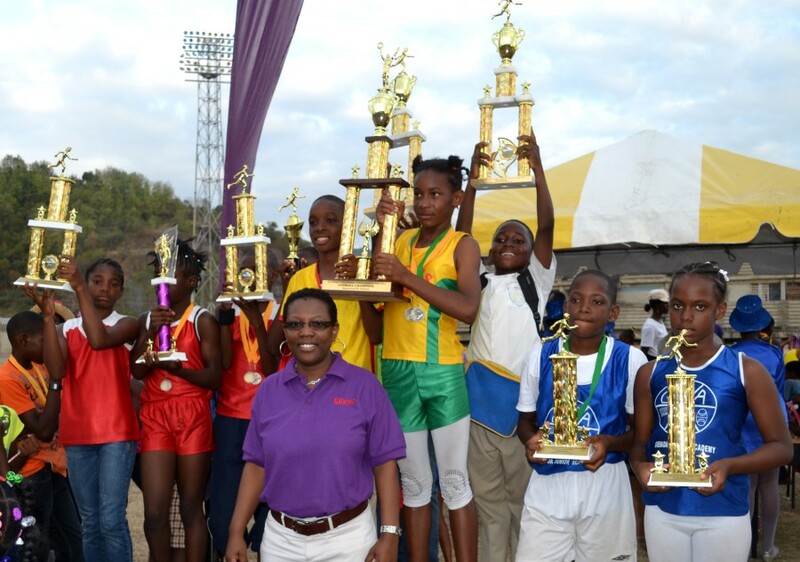 SSGGS also walked away with trophies in the Female and Male Under 7 (Kevonna Allard and Anson Morris) and Female Under 11 in the person of Katelann James. GJA also captured three divisions. They were Male Under 9 — Zane La Rose, Female Under 13 — Aaliyah Bartholemew and Male Under 13 — Shane Derby. SGA’s sole division winner was Micah Henry who won the Male Under 11 Division. Grand Anse RC School (Kia Hillaire) was victorious in obtaining the Female Under 9 Division. Anisha Mathurine and James Samuel of St Pauls Government School won both the Female and Male Open Divisions. This year a total of fourteen schools in the parish of St. George’s took part. Geo. F. Huggins & Co. (G’da) Ltd. congratulates not only the winners but all the participating schools for their tremendous contribution to the success of the championship. The question left to be answered is, “Will St George’s be able to successfully defend their championship title at the upcoming Grenada Union of Teachers National Primary Schools Athletics Games?” The answer to this will be known soon.